The British planned a second attempt to capture the ‘Sugar Loaf’ salient and asked the Australians for help. This plan was cancelled but the news arrived too late to stop the Australians mounting another attack with equally disastrous results. In short, the Australian and British attempts to take the ‘Sugar loaf’ failed completely. (50 mi) to the south. 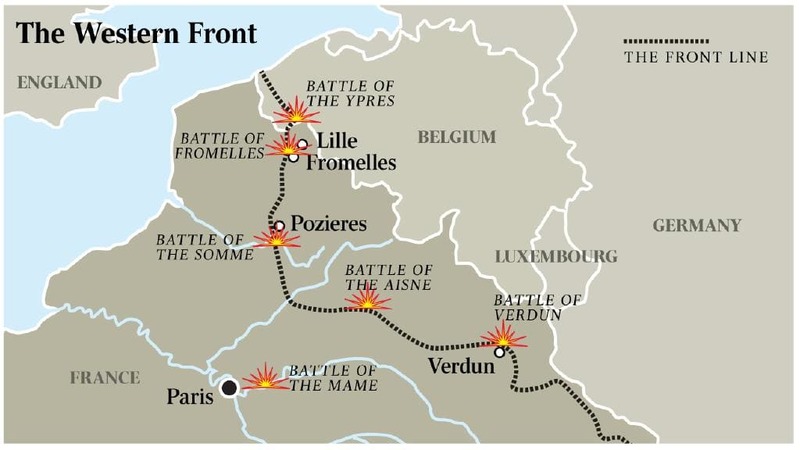 The operation, carried out midway between the British-occupied village of Fleurbaix and that of Fromelles behind the German lines, sought to retake a salient just north of the latter, situated at about 16 kilometres (9.9 mi) from the city of Lille. British and 5,533 Australian soldiers were killed, wounded or taken prisoner.The Australian War Memorial describes the battle as "the worst 24 hours in Australia's entire history. It was a decisive victory for the German Empire, and the Australian and British losses were sustained without the Allies gaining any ground. Division suffered 6848 casualties, the greatest number ever endured by an Australian division in one tour in the front line. The Battle of Pozières was a two week struggle for the French village of Pozières and the ridge on which it stands, during the middle stages of the 1916 Battle of the Somme. Though British divisions were involved in most phases of the fighting, Pozières is primarily remembered as an Australian battle. The fighting ended with the Allied forces in possession of the plateau north and east of the village, and in a position to menace the German bastion of Thiepval from the rear. However, the cost had been enormous, and in the words ofAustralian official historian Charles Bean, the Pozières ridge "is more densely sown with Australian sacrifice than any other place on earth." In less than seven weeks in the fighting at Pozières and Mouquet Farm three Australian divisions suffered 23,000 casualties. Of these, 6800 men were killed or died of wounds. It was a loss comparable with the casualties sustained by the Australians over eight months at Gallipoli in 1915. 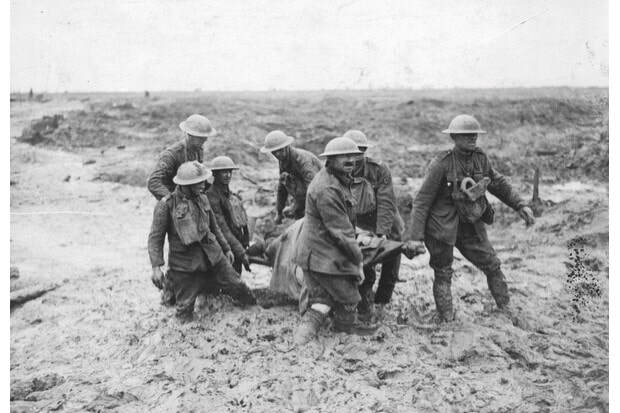 The fight now was about seizing suitable positions for the winter during which major campaigning was impossible … These actions were made in some of the worst conditions the Australians were to experience on the Western Front … the main battle was against mud, rain and frost-bite. The Germans planned to have the Hindenburg Line ready in early 1917, and then they would withdraw to these new trenches. The new line would be straighter and shorter requiring fewer divisions to man it. Early-model tanks were slower than a walking man, their steel was thin and deadly shooting by German artillery meant none reached the wire before the Australian infantry … Higher-level staff members believed that the advance was not being held up. Therefore the artillery was not allowed to fire and the Germans were able to counter-attack with impunity. British and French leaders agreed to … a combined British and Australian attack on the Hindenburg Line around Bullecourt where the previous attempt had failed so disastrously … One Australian historian described the fighting at Bullecourt as the taking of a small, tactically useless village at a cost of more than 7,000 Australian casualties. failed to achieve its more ambitious aims and this had resulted in the demoralisation of French troops and the dislocation of the Anglo-French strategy for 1917. The offensive at Messines forced the German Army to move reserves to Flanders from the Arras and Aisne fronts, which relieved pressure on the French Army. The tactical objective of the attack at Messines was to capture the Germandefences on the ridge, which ran from Ploegsteert ("Plugstreet") Wood in the south through Messines and Wytschaete to Mt. Sorrel, to deprive the German Army of the high ground south of Ypres. The ridge commanded the British defences and back areas further north, from which the British intended to conduct the "Northern Operation", to advance to Passchendaele Ridge, then capture the Belgian coast up to the Dutch frontier. 700 yards (640 m) deep, which allowed the advancing British troops to secure the ridge with support from tanks, cavalry patrols and aircraft. The effectiveness of the British mines, barrages and bombardments was improved by advances in artillery survey, flash-spotting and centralised control of artillery operations from the Second Army headquarters. British attacks from 8–14 June advanced the new front line beyond the former German Sehnen (Oosttaverne) line. 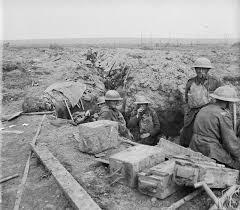 The Battle of Messines was a prelude to the much larger Third Battle of Ypres campaign, the preliminary bombardment for which began on 11 July 1917.
advanced at 5.40 am on 20 September. They were in the centre of an assault by 11 British divisions along Westhoek Ridge facing Glencorse Wood. Charles Bean, the Australian official historian, wrote that the Battle of the Menin Road:… like those that succeeded it, is easily described inasmuch as it went almost precisely in accordance with plan. The advancing barrage won the ground; the infantry merely occupied it, pouncing on any points at which resistance survived. Whereas the artillery was generally spoken of as supporting the infantry, in this battle the infantry were little more than a necessary adjunct to the artillery’s effort. artillery and other supplies could be moved forward, roads had to be built. roads and tracks exposed to heavy shelling. Horses and drivers suffered greatly. as any achievement of Australians in the war. attack was almost derailed by a German attack 24 hours earlier on British troops holding the line to the south of the Fifth Division. Australians, scheduled to attack the next morning, helped to fend off the Germans, but there was some concern about the possible weakness of this flank during the upcoming operation. seemed to break out … with a single crash. The ground was dry, and the shell-bursts raised a wall of dust and smoke which appeared almost to be solid. So dense was the cloud that individual bursts … could not be distinguished. Roaring, deafening, it rolled ahead of the troops ‘like a Gippsland bushfire’. barrages used to protect the infantry consolidating their objectives. The Battle of Polygon Wood cost 5,770 Australian casualties. their first glimpse of the lowlands … since May 1915.
counter-attacked and … succeeded in pushing the Germans back, ending their action. action at Morlancourt between 4 and 9 May led to the the seizure of the new German front line. together with the cavalry, the vital heights of Hill 104 north of the town. Australians north and south of the town. The plan was for the Australian units, attacking by night, to envelope Villers-Bretoneux and join forces to the east of the town. To the north of Villers-Bretonneux the Australians attacked across Hill 104 with great success. However, the northern and southern arm of the attack were unable to join up in the dark leaving a gap through which many Germans managed to escape. After dawn, the gap was gradually closed and Australians entered the town from the east and British from the north and west. Villers-Bretonneux was cleared of enemy troops on 25 April 1918, the third anniversary of the Anzac landing at Gallipoli. This action marked the effective end of the German drive towards Amiens although the enemy offensive rolled on against French and American forces further south towards Paris. Villers-Bretonneux never forgot the Australian driving out of the Germans from their town and the Australian Corps also sought to build their memorial on the Western Front on Hill 104 north of the town. This plan never eventuated but in the 1930s the Australian Government built the Australian National Memorial on that site, which is also a memorial to those Australians who lost their lives in France between 1916 and 1918 and have ‘no known grave’. from the massed attacks mounted earlier in the war, illustrate the evolution of modern military tactics. All the allies' objectives were achieved in 93 minutes, just three minutes more than Monash's calculated battle time of 90 minutes. Using conventional tactics, the fighting could have lasted for weeks or months, with much higher casualty rates. For example, a similar defensive position had resisted allied capture for two months at the Battle of the Somme. The battle was the first time in the war that American troops participated in an offensive action under non-American command. Four American companies joined with Australian troops under Australian command, although three were recalled before the battle. 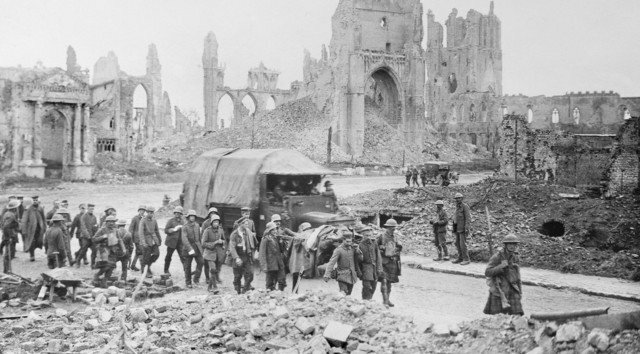 The Canadian and French attacks had gone as well as those of the Australians and 25 kilometres of the German front south of the Somme was swept away in a victory that far surpassed any previous success of the British Army on the Western Front. The soldiers were exhausted after days of marching and hard fighting against an enemy as yet by no means beaten. Monash now decided to push them even harder and to take Mont St Quentin and Péronne … On those three days … the Australians – at a cost of 3000 casualties – dealt a stunning blow to five German divisions and caused a general German withdrawal. On 18 September 1918 Australians captured 4300 prisoners and 76 guns at a cost of 1260 casualties. They had shown how vulnerable the Hindenburg defences were … it now seemed possible that the war just might be brought to a successful conclusion before the winter of 1918–19. Australians were killed in World War I.